Have you got Liverpool’s most common disease? It’s a disease that makes your breath smell, mouth bleed and if left untreated can cause your teeth to fall out. It’s a disease that increases the risk of heart disease, premature birth, cancer, depression, dementia and obesity. It’s a disease that’s carried (in some form) by a staggering three out of four adults over 35 here in Liverpool. The latest NHS statistics tell us that and over 3/4 of adults over 35 have gingivitis or periodontal disease and 95% of individuals in Liverpool will suffer from some form of gum disease in their lifetimes. Worryingly, children are more and more at risk of gum disease and decay in Liverpool and we have the highest incidence of children under 5 with decay out of the entire uk. These statistics are worrying but that doesn’t mean that you need to be part of them. Dental Hygiene Therapists say ‘gum disease is treated at home’ which means that simply brushing your teeth, using Tepe brushes or floss and maintaining a good oral hygiene routine (including trips to the hygienist) will keep your gums and teeth healthy for your entire life. The success rate for gum disease treatment is extremely high at Smileworks and we help dozens of patients feel great about their smile each month. 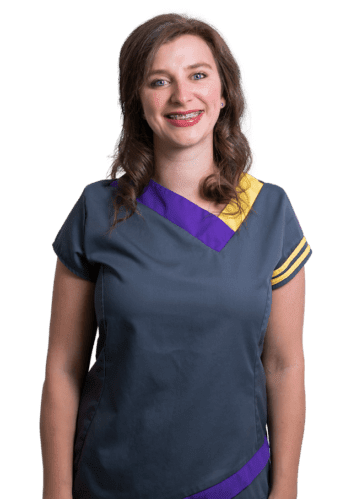 Call the office today and speak to a member of the team about getting an appointment with either of our hygiene therapists. It’s never too late to start thinking about a healthy smile and there’s no problem that can’t be fixed by our expert team. Here at Smileworks we love treating gum disease because it means developing great relationships with our patients and watching your confidence and happiness increase as your smile and health improves. It also means that teeth can be saved from requiring extraction. More about hoe gum disease can lead to extraction if untreated here: Tooth Extractions Liverpool. If you have tooth decay then you may need a tooth filled and we offer composite tooth filling at Smileworks. If you are in more severe pain then follow the link here to our dedicated page abut root canal treatment. Gum Disease is an infection of the gums that causes them to become inflamed and red. If left untreated, this gum infection can lead to gum recession and also attack the bone, ligaments and structures that support your teeth causing them to become loose and eventually fall out. Gum disease also causes you to have unpleasant smelling breath. Gum disease is exacerbated by smoking and certain ‘dry mouth medications’. It’s caused by plaque, a sticky film of bacteria that forms on the teeth and gums. Brushing regularly removes this plaque although you will need to visit the hygienist (or dental hygiene therapist) to have your teeth scaled every three to six months. Scaling is where a high pressure jet of air and water is blasted under the gum-line to remove plaque and bacteria that brushing cannot reach. Sometimes you can get bad smells and abscess-like symptoms from impacted wisdom teeth. This is not the same as gum disease and causes pain in your wisdom teeth (or third molars). Often the wisdom teeth need to be extracted and you can read more about that here: wisdom teeth removal. Sometimes gum disease can occur when you have braces on or are undergoing orthodontics. To see Dr Laurence Masters explain how to effectively brush your teeth with braces then follow the link. When patients come to smileworks they will have a number of diagnostic checks as part of their check-up. Your dentist or dental hygiene therapist will take x-rays. The reason we do this is the measure the amount of bone loss and any damage to supporting structures of the teeth. Remember the bacteria damage your bone and this is what makes your teeth wobble with advanced periodontal disease. We will also conduct a ‘pocket chart’. This is not a chart you keep in your pocket but a depth measurement of the ‘pockets’ between the gum and bone. The deeper the pockets in mm the worse the situation. Bleeding is often not common with advanced periodontal disease because the blood pools in the pockets and you don’t see it. When gingivitis is left untreated and you are not regularly brushing, flossing or using intra-oral brushes, you will develop full gum disease or periodontal disease. This is where the bacteria in the plaque causes a full blown infection in the mouth. It’s not the actual bacteria that cause the problems but how your body responds to the bacteria that causes many of the issues associated with gum disease. Possibly some or all of the symptoms of gingivitis. your teeth are spreading out, moving or becoming loose. This is where the bacterial infection is severe and chronic. You will notice severe gum recession, wobbly or loose teeth and you may have a number of missing teeth. When the disease has progressed this far there is an increased risk that you may develop other systemic health problems as a consequence. Brushing and oral hygiene will not be enough to treat advanced perio and you will need to come to see your dental hygiene therapist for a treatment plan to get the disease under control. Here’s a helpful video explaining periodontitis in more detail including your treatment options. If you were bleeding from your ears or nose every day would you just ignore it or go and see a doctor? Of course you would see a doctor! Likewise if you had a swollen or infected hand would you go and see a doctor or just leave it? Gum disease is an infection of a significant part of your body and you must get it treated if you want to keep all your teeth and have a healthy smile. But more than this, gum disease is also linked to a whole host of other inflammatory diseases and can create problems with your overall health if left untreated. Call the office on 0151 236 5166 or fill in the form below and speak to someone about gum disease treatment at Smileworks. It’s never to late to start your journey towards a healthy smile. As we’ve already said, the best treatment for gum disease is prevention. The best way to get rid of gum disease is not to get it in the first place. Gingivitis treatment will usually start with brushing twice daily, using Tape brushes and flossing. Take a look here at the Smileworks guide to Oral Hygiene Gadgets for a great review of all the different oral hygiene tools and hacks available to keep your teeth and gums healthy. If the problem is more severe and you have periodontal disease then this can be treated at the dentist with more frequent hygiene appointments. Patients with healthy mouths should visit the dental hygiene therapist or hygienist at least twice a year. For individuals with periodontal disease, you’ll need to visit four times a year or even more. The therapist may also proscribe special antibiotics that will help your body fight the infection and get your period under control. Many patients ask whether periodontal disease has a cure. The answer is that it cannot be ‘cured’ but can be managed so it stops causing you more problems in the future. if you have advanced periodontal disease then your dental hygienist therapist will need to conduct additional treatments to stabilise your gum disease including a course of antibiotics and frequent debridements to remove the plaque, tartar, dead tissue and debris from around the teeth and gums to allow the infection to heal and your situation to improve. This will incur an additional cost but patients are often surprised at how much can be done and how their position can improve without spending very much money. Here at Smileworks our dentists very rarely if ever treat gum disease. We leave it to the experts who are dental hygienist therapists and spend their entire careers treating and managing gum disease. This is not only a better solution to get you the results you deserve but also a less expensive alternative to being treated by a dentist. Gum disease treatment is not a simple fix and it involves work from both the hygiene therapist and you to fix the problems and improve the health of your mouth. Treatment can take months and often seems to get worse before it gets better. This is normal though and your dentist or hygienist will give you all the advice you need on what to expect during your treatment. We have a variety of dental memberships. Save money with your regular check ups and make sure your Gum Disease is under control permanently from this point forward. Our plan is better value and offers much more than a Denplan membership. Check out the details here. Gum disease can sometimes be painful but a lot of the time there is no pain from the infection. This is one of the main reasons it is such a widespread disease. People assume that everything is ok so long as it doesn’t hurt. Treatment for advanced gum disease is not painful and your therapist will use local anaesthetic to numb the treated areas before any potentially painful work is carried out. Here’s our complete and unbiased review of the best (and worst) oral hygiene gadgets of 2017-2018 compared just for you by our cosmetic dentists and therapists. click the link to download and also watch our video where the team discuss their findings. 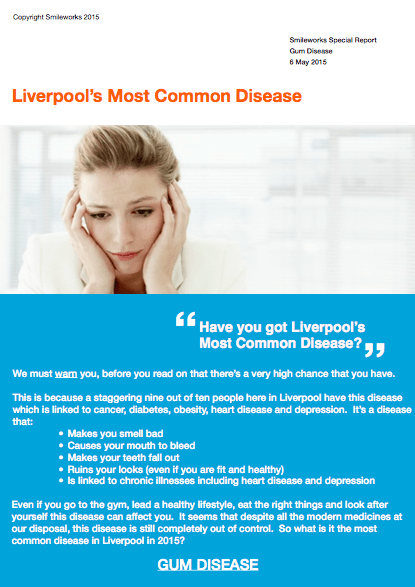 Click the image to download our report; “Liverpool’s Most Common Disease”. When you have fixed braces, it can be more difficult to keep your teeth clean and patients are at slightly increased risk of gum disease. During your braces treatment, your dentist or orthodontist will keep a close eye on the health of your smile and instruct you on how to keep your teeth, gums and braces clean. If you already have periodontal disease then this must be brought under control before you undergo orthodontic treatment. This is fairly common and having gum disease doesn’t mean you can’t get braces it just means we need to teat it before we start orthodontic treatment. Smileworks braces patients get hygiene appointments as standard and you can be assured that your gum disease will be fully controlled so that you can get your teeth straightened and get the smile you deserve. Dr. Charles (Chip) Whitney of the American Academy of Oral and Systemic Health (AAOSH) gave a wonderful keynote speech in 2017 about the link between oral health and systemic (overall) health. There is a powerful effect of oral bacteria on cardio vascular disease and many other diseases an this is proven to a high standard in medicine. There is an incredible amount of illnesses including heart disease, stroke, diabetes, preeclampsia (premature birth), cancers and even dementia. Many of these associations are ‘Level A Associations’ which mean there is a direct cause. There is also a possible association between fertility and gum disease. So if you needed a reason to get your gum disease treated, then this is certainly it. Many people don’t get treatment and say ‘gum disease can’t kill you’ but it’s clear from these findings that this statement is not entirely accurate. Gum disease is exacerbated by certain medications. The reason for this is that they cause you to have a dry mouth (also called xerostomia). Your dentist or Dental Hygiene Therapist will take a full medical history and discover whether medications you are taking might cause your gum disease to worsen.